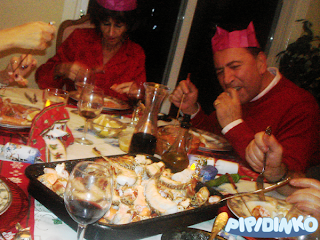 We had a Christmas eve dinner at our house last night. Family members came to celebrate the occasion together. There was lots and lots food, Santino got cool trucks as gifts, and I managed to fill the house with the smoke from the fireplace. Yay, fun times! 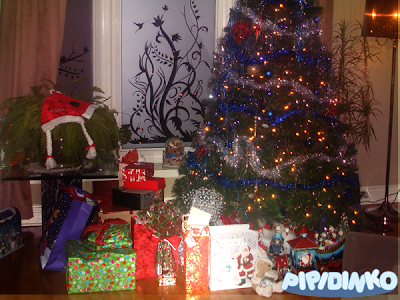 Santino also had a few gifts prepared to give to his grandparents and aunts and uncle. 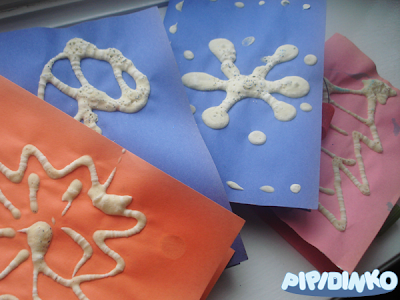 Mommy (me) found these awesome ideas Puffy snowflakes and Salt Dough Ornaments online and decided to make some cool Christmas cards and gifts for the family. I mixed up the dough and made the cards and the ornaments, and Santino decorated them with glitter glue. 1/2 cup of all purpose flower, 1/3 cup of salt, 1 tsp of baking powder, water to make pancake type of consistency dough. Mixed it well and put in the plastic mixing bottle (we normally use it to shake oil and vinegar for salad dressing). I gave Santino a chance to try and draw whatever he wished with this dough, but all he did was make a large puddle, squishing everything in the same spot. That's fine. I made a few simple designs on colorful construction paper, then put the cards in the microwave oven for 30 second. The designs dried out and were ready for more decoration. I gave Santino glitter glue, and he smudged different colors on top of the white lines. Now the cards became raised and glittery. I then mixed up some more salt dough, but more stiff: 1/2 cup salt, 1 cup flower and 1/2 cup water. Rolled out the dough and cut out ornaments with some cookie cutters: Christmas trees, snowmen, angel. I then put these ornaments in the 250 F oven and left them there for an hour. They came out pretty stiff. I also made little holes for ribbons. 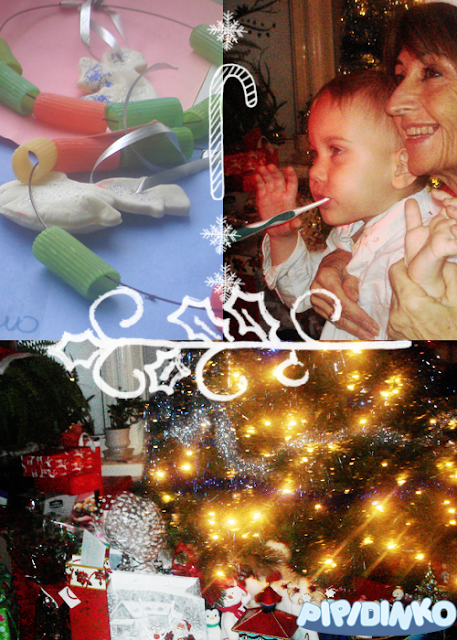 Santino painted the ornaments with different colors, decorated them with glitter glue. I put silver ribbons through the holes and attached these ornaments to the cards with wire ties. 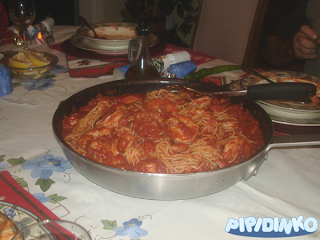 I also colored some pasta and Santino made these necklaces for both of his grandmothers, and two aunts. I was left out, as Santino ran out of steam and wasn't interested in making the 5th necklace. I got this idea from his school. 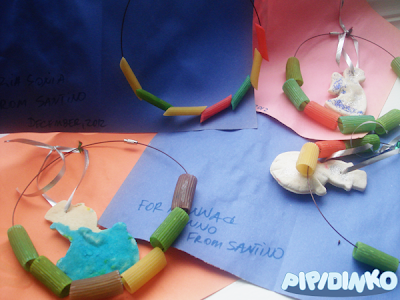 Last month kids at the Armitage village nursery school made these necklaces, and the teachers were impressed with Santino's fine motor skills, who is the youngest in his group, as he was able to make a necklace all by himself.